ADIC - X - La Mémoire de la Traite des slaves païens dans le Haut Moyen Age : quelles conséquences en filigrane sur l'eurocentrisme ? Slavery in medieval Europe - Soldats-laboureurs dans les Marches allemandes - La Bulle papale autorisant le Saint-Empire romain germanique à entrependre les razzias en terres des Slaves païens ? Pages ADIC : points communs avec le Devchirmé et sa Mémoire ? 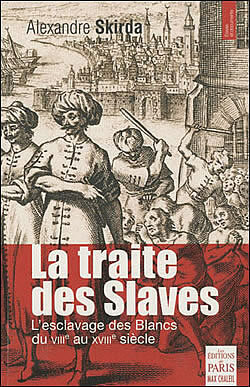 - any publications on the Early Medieval Slavic Slave Trade ? The Holy German Roman Empire was at the front to organize the razzias in slavic pagan lands (with the consent of the Pope). The captive arrived into the southern Italian ports (Bari, Salerno, Amalfi, etc.) and were shipped to the Arab Caliphate ports of Egypt, etc. - and for today's politics in European Union, to understand why Poland is standing for the entrance of Turkey in the E.U. - Africa is going to be less and less weak. Thanks to China it will be more industrialized, etc. Africa is going strongly to reproach Europe its colonial past and Black Trade which emptied Africa. - Historically, Poland which is in Central Europe did not participate to Black Trade which created international capitalism (Shipyards, Insurances, Banks, etc). - Poland which wants to play a local leadership aside Germany, will one day reproach this historical crime to the west. Poland is clean : "the Western Europe should not show off too much" << what Poland will insist more and more. This unconsciously (or on the unspoken level) explains this reaction of Poland encouraging Turkey (a non european country) to enter E.U. It is important to see, to analyze the mechanisms, the consequences of this historical Slavic slave Trade which are the roots of Eurocentrism. X - Inconscient(s) collectif(s) arméniens, Mémoire(s) et 1915 > (5) > Mémoire(s) > 4. Memoires comparees > Traite des slaves païens dans le Haut Moyen Age & Germanisation des villages baltes et polonais par l'Ordre des Chevalliers teutoniques : recherches bibliographiques.